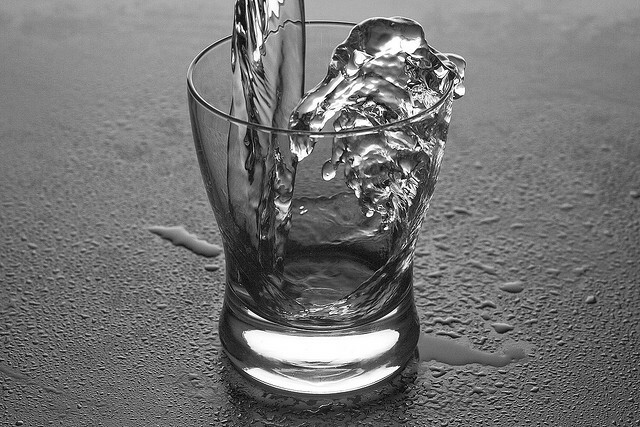 It’s coming up to a year now since I decided to do the one, free thing that’s supposed to make a big difference to your health, but which hardly anybody does – drink eight glasses (or two and a half litres) of water per day. So it’s no substitute for decent nutrition, but it will help make the most of whatever nutrients you do have and make you feel all round well-oiled and tippety top. That’s the theory, so what was the reality? What difference did it make to drink all this water? The biggest difference it has made is to my skin, which is substantially softer than it was. No more dry patches on my elbows or knees. No need for heavy moisturisers. I don’t think my skin looks all that different, but it definitely feels different, which is a nice treat for anyone who brushes up against me. My skin is clear and I haven’t had a headache all year. Health-wise I feel pretty good. The biggest visible difference is that I have lost 11 lb in total across the year with no dieting. The only change in my eating habits happened the week I did the all juice detox. I lost 6 lb that week, and over time put 3 lb of that back on. So maybe 8 lb over all can be attributed to the water. It definitely stops me snacking in the afternoons when I have a tankload of herbal tea to get through. There have been two weeks in the last year when I didn’t do the daily water target – once over Christmas and once whilst on holiday. Both times I noticed a difference immediately – my skin was dry and I felt like crap, essentially. And coincidentally, quite constipated. The main thing I used was an iPhone app called iDrated, which I bought for 69p. There are lots of apps around nowadays to help you track your water intake, and if you are the sort of person who keeps your phone with you most of the time then it makes sense to do it like this. It calculated the 2.5 litre target, although The European Food Safety Authority recommends that women should drink about 1.6 litres of fluid and men should drink about 2.0 litres of fluid per day. So possibly I could dial it back a bit. 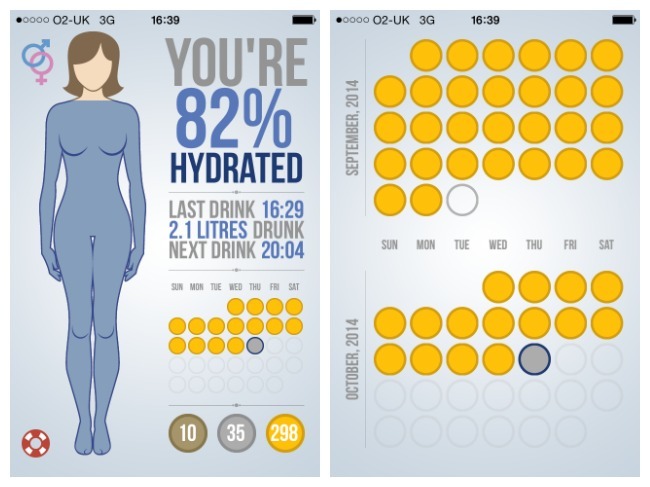 The app awards you a bronze, silver or gold medal depending on how close you come to the day’s target fluid intake. After I’d installed it, I went round my house and measured all the glasses and cups I use by filling them full of water and then pouring it back into a measuring jug. I generally start the day with a double sized 600 ml cup of tea from my Harry Potter mug. Around lunchtime I have a 750 ml bottle of water, with a tiny bit of squash if I’m feeling racy. Throughout the afternoon I will have one or two cups of herbal or regular tea, plus a glass of water with dinner. After dinner I will check my daily target and see if I need to top it up. I usually do. 2.5 litres is more than you think, and probably more than you’d drink. The big question people ask about this is – aren’t you running to the loo a lot? Well, not as much as you might expect. The body gets used to this much liquid, and you only really run into multiple wee issues if you drink too much late at night, or if you’ve had a break and are restarting the 2.5 litres a day programme. The big problem happens when it gets to 9pm and you are a litre down on your day’s target. Then you have to make a choice – am I prepared to be up half the night peeing just so I can earn a gold medal on my chart because I drank all the water? This is where gamification really does help us behave healthier, as my desire for a meaningless gold disc that only I would see won out over my desire to sleep through the night. 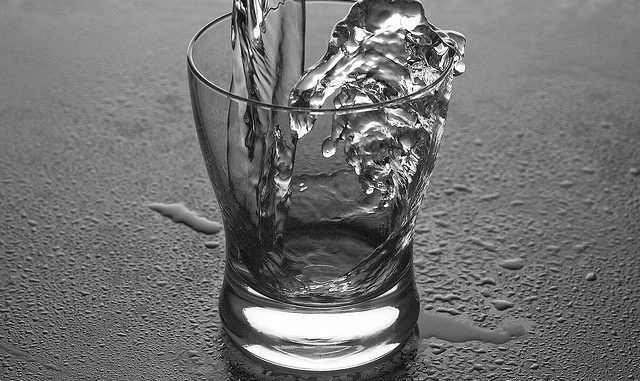 And yet for all of this, drinking water has not become a natural habit. I still have to clock my water intake every day. I think this is why so many people struggle with this and don’t persevere with drinking water. It’s harder than it sounds. There will possibly be other longer term benefits, but there is no real way of measuring those, so I just have to hope that this is an investment worth making in my long term health. I would love to hear your comments on this. How much water do you drink per day? Have I convinced you to drink more or have I put you off?